Photograph courtesy of Judy Conder. (APN) COLLEGE PARK, Georgia — On Sunday, January 29, 2017, Atlantans joined massive nationwide protests that exploded in over thirty U.S. cities in response to President Donald Trump’s latest Executive Orders banning all Muslims citizens from Iraq, Syria, Iran, Libya, Somalia, Sudan, and Yemen from entering the United States for ninety days. Syrian refugees, from that war-torn area, are indefinitely barred. Only Christian refugees from these countries are allowed to enter the U.S. 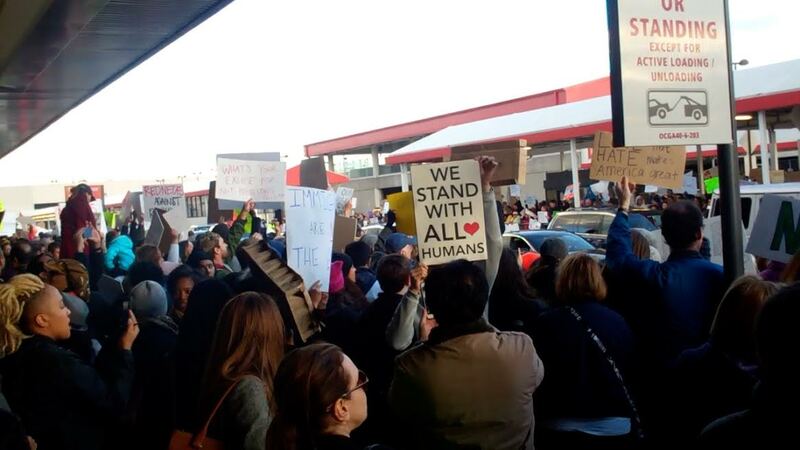 In Atlanta, over five thousand people showed up at the Hartsfield-Jackson International Airport to say no to Trump’s Islamophobic and xenophobic immigration policies. 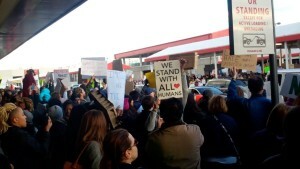 Eleven people were detained in Atlanta, and all were legal residents of the U.S. with green cards. U.S. Reps. John Lewis (D-GA) and Hank Johnson (D-GA) joined the families at the airport, along with immigration attorneys. “This is blatantly unconstitutional. The administration is engaging in clear discrimination against Muslims through this repugnant ban,” Azadeh Shahshahani, Legal & Advocacy Director of Project South, told Atlanta Progressive News. Lawsuits have been filed by ACLU and others against Trump for unconstitutional executive orders. U.S District Court Judge Ann M. Donnelly has granted a temporary injunction that will block the deportation of all people stranded in U.S. airports. Thousands in the U.S. have shown compassion and support for innocent immigrants who have green cards and valid U.S. visas, but now can’t enter the country. Refugees are fleeing for their lives from war-torn regions; some of the impacted people have worked with the U.S. military and are the most carefully vetted people in the world. No one from Trump’s list of seven countries has carried out a lethal attack in the U.S., but most of the named attackers from September 11, 2001, came from Saudi Arabia, which is not on the list. President Trump’s business relationship with Saudi Arabia may have influenced their exclusion from his hit list. Trump did not follow normal channels and left agencies and U.S. Congress out of the loop. He may have grandiose plans to go it alone and not include Congress, but he may find the people ungovernable if he tries this. The United States of America is not one of Trump’s private companies to bankrupt and then throw away and start over. In Trump’s first week, he has started a trade war with Mexico; started a travel war with the Middle East; named Stephen Bannon, who promotes White supremacy, as his National Security Advisor; and alienated millions of people in the U.S. and countless people around the world. Trump’s “alternative facts” blind him to the reality that it is White right-wing Christian extremists, like Dylann Roof and Timothy McVeigh, who are killing many people in the U.S.
On January 20, 2017, hundreds of people from over 20 diverse organizations marched to Atlanta City Hall to demand, among other things, that Mayor Kasim Reed declare Atlanta a Sanctuary City. “If he comes for one in the morning, he’ll come for the rest at night. That is why we stand together for a better world for all of us,” Adelina Nicholls, Executive Director of the Georgia Latino Alliance for Human Rights, said. “We demand that the City of Atlanta repeal all city laws and policies that degrade, discriminate and cause harm against undocumented individuals and their families, Black lives, people of color, women, Muslims, immigrants, refugees, trans and queer people, and poor people,” Toni-Michelle Williams, Coordinator, Atlanta Solutions Not Punishment Coalition (SNaP-CO), said as she began to read the coalition’s demands on the steps of Atlanta City Hall. Mayor Reed issued a statement on January 26 condemning the Executive Orders, but stopping short of declaring support for Atlanta becoming a Sanctuary City. State Sen. Vincent Fort (D-Atlanta), a candidate for Mayor of Atlanta, has declared his support for doing so if elected. The ban was against citizens of seven counties that are majority Muslim, the same counties under threat by President Obama. The ban was not against Muslims. Please get your facts straight or else go work for the AJC.